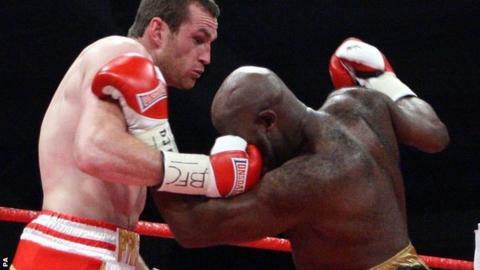 David Price defended his British and Commonwealth titles with a second-round knockout of Matt Skelton in Aintree. Liverpudlian Price, 29, had his jab working by midway through the first round and stiffened the challenger with a couple of trademark rights. Skelton crumpled under a barrage of body shots in the second and was counted out two minutes and 56 seconds into the round. Price is now unbeaten in 15 professional fights, with 13 knockouts. "David Price carries serious power through the fight, any time he lands cleanly you can see that it is the beginning of the end. "What impressed me tonight was his variety though. He went to the body so well, which, when you are 6ft 8in like he is, is not easy. It was not just left hooks to the body, but also right hooks and uppercuts up the middle. "He has a great repertoire of punches for a big guy. He also showed composure beyond his years. Fighters of his age could get flustered, reacted and try and load up, but he took his time and did not get goaded into a war." He told BBC Radio 5 live: "Matt's a rugged, tough, customer. I've got a lot of respect for him and wish him all the best. "I had to pull that one out of the bag today, get the job done, and I did." Price's promoter Frank Maloney is in talks with American veteran Tony Thompson for a fight in the spring of 2013 that will probably take place at Liverpool's Echo Arena. The latest of 41-year-old Thompson's three career defeats came against Wladimir Klitschko when challenging for the Ukrainian's world heavyweight titles in July. "He'll be ready for a world title fight in 2013," said Maloney. "We'll name an American opponent this week." Price, who disposed of Audley Harrison in only 82 seconds last month, needed another spectacular display to placate critics of the quality of his opponents. While former Olympic champion Harrison's star faded long before Price got him in the ring, Skelton is a 45-year-old who last held a title in 2008. But Skelton, a former world title challenger, was always likely to provide a sterner test than Harrison and he came racing out of the blocks, backing Price onto the ropes with a bullocking attack straight from the bell. However, once the 6ft 8ins Price found his range with his jab and started firing with his huge right hand there only looked like being one winner. He rattled a game Skelton with a couple of overhand right hands in the first and landed with a booming right uppercut a minute into the second, after which the challenger never fully recovered. And when Skelton disintegrated under a flurry of six or seven unanswered body shots, his corner threw the towel in before he could be counted out. Price added: "It wasn't my best performance. But I did a professional job in the end. It was a matter of 'when' not 'if'. John McDermott (21 January) First-round stoppage. Sam Sexton (19 May) Fourth-round knockout. "I probably could have asserted my jab a little bit more. But, all in all, I'm happy, I've capped a great year off and next year's going to be massive." It was Price's second defence of the Lonsdale Belt he won with a fourth-round knockout of Sam Sexton in May and his ninth consecutive win inside the distance. Price has few options left at domestic level, although he has expressed an interest in fighting former British champion Dereck Chisora. Meanwhile, Manchester's Tyson Fury, who fights American Kevin Johnson in Belfast on Saturday, is on the verge of a world title shot against either Vitali or Wladimir Klitschko, who share all four of the major world title belts.